Usually data is aligned, as you put your code in data section, and by default sections are aligned to 4096 bytes. Anyway aligning code can give you some speed - like on my maschine. BTW, all fasm's dword-size data is aligned to dword boundary in the official releases. 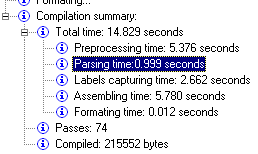 Description: Compilation times of Fresh 1_0_1C with new parser by Privalov. BTW: nice speed optimizing Privalov! Following our guru Privalov, and using almost the same approach, I rewrite the label tree creating, so now it is lightning fast (approx 4 times faster)! New work version is uploaded. Please make some tests of the speed (and there are bugs maybe...) on different platforms. 1) Please create a new form. After that you can see that fresh is HALTed. No, it's not a bug at all. It is feature...still not implemented. It is in my TO-DO list exactly after code completition. Because I suppose that CC will help me to write faster. Two bugs: when you move mouse cursor over some toolbar icons (comment, indent...) no hint is displayed. Also, when you use those functions when there is no text selected, they work with two lines (instead of one line, where cursor is placed). Uploaded work version with one new feature: "Labels explorer". It shows all labels in dialog window, and the user can check values, types and structure of the labels tree. It is still not finished, but I posted it for evaluation. I need opinions how usefull you think it is and how to implement it the best way. Also, you can suggest any other useful features, based on information about labels. For example I think about "right click|Label info" function in the editor. I agree that this feature is very useful, but why not to make "label explorer" be a non-modal window? And adding "goto declaration" feature would be nice (if possible with current Fresh structure). 1. FASM keeps the pointer to first place where label is used, not to the place of declaration. 2. This pointer don't give me to capture the filename and row number in the source, because there is no (at least I still can't find it) easy way to trace back in the preprocessed source, but the row number and file name are in the begining of each line in preprocessed code. Just when I make this, there will be source editor function "goto declaration". "Goto declaration" - when you click label in the editor with ctrl pressed, "Goto address"- small dialog where you enter address and Fresh moves you to the source line (or closest line possible), "tooltip with info" - when you point some label in the editor, etc. Tell me what more info you need and I'll give it to you!